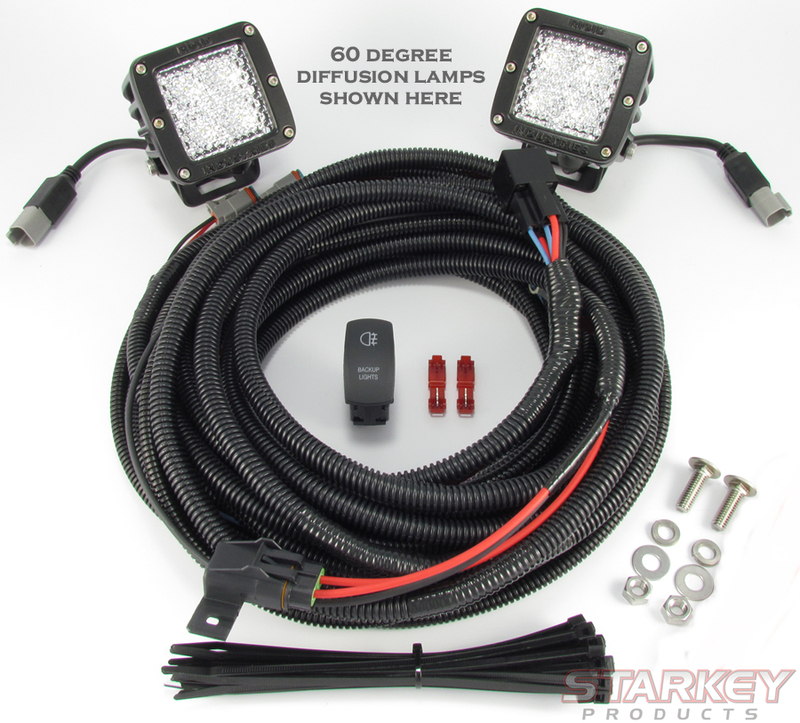 Complete Truck & SUV Backup/ Reverse Lighting Kit with Rigid Industries LED Lamps - Fits All Trucks & SUV's! Ever tried backing up in a dark parking lot or hitching up your trailer at night? 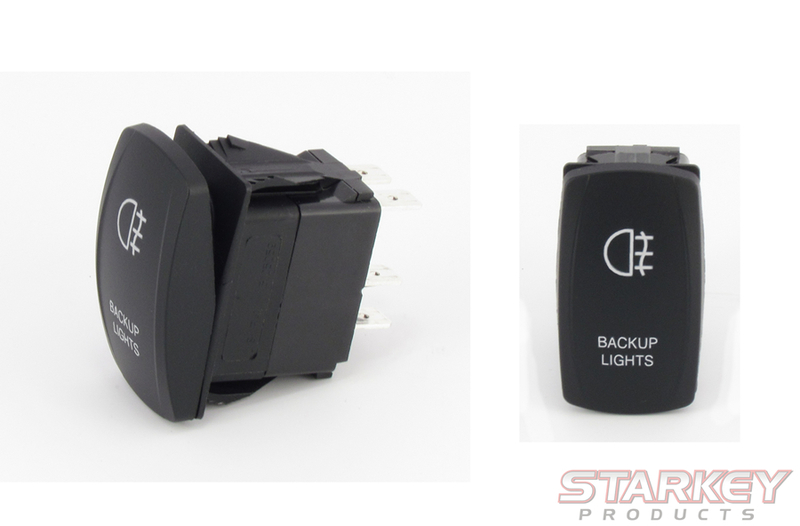 Factory reverse lamps simply don’t provide enough light when function or safety is in mind. 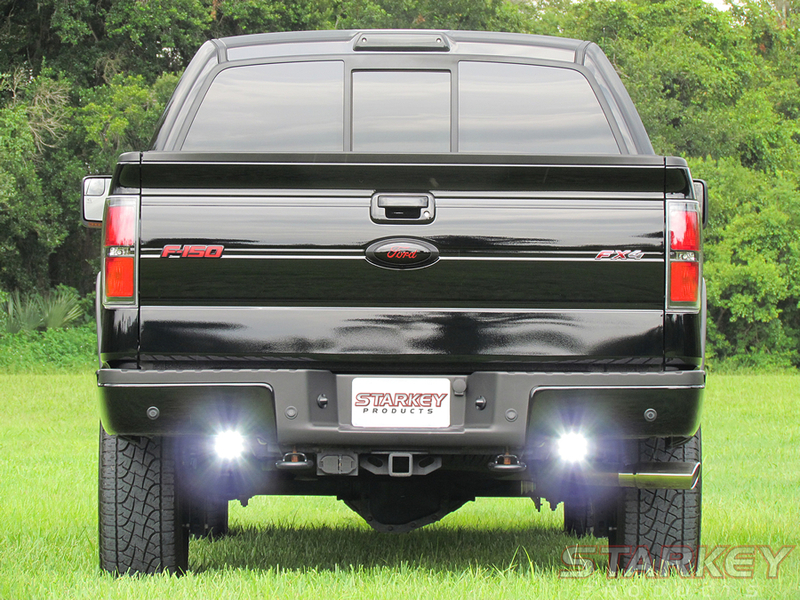 Our reverse lighting kit includes all parts necessary to install auxiliary lighting on your Truck or SUV. Never hitch up your trailer or boat in the dark again! 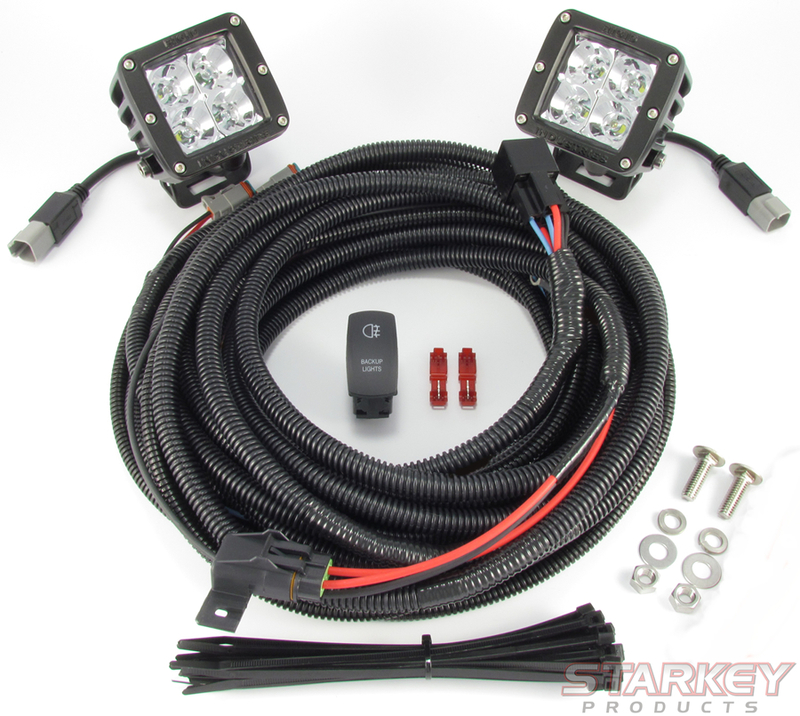 New Auxiliary Lighting Kit Available! Click here for details! We use Rigid Industries lamps with this lighting kit. Our wiring harness is designed to work with Deutsch-style 2-pin connectors which are found on Rigid Industries LED Lamps. If you prefer to use another brand of lamps, see Starkey part number 5051 for wiring & switch only kit. Rigid Industries LED lamps are included to insure long lasting performance and reliability. Because LED’s have a life span of 50,000+ hours, you’ll never have to replace a bulb again. In addition, they use 10% of the energy that a halogen bulb uses and produce a brighter, whiter light. 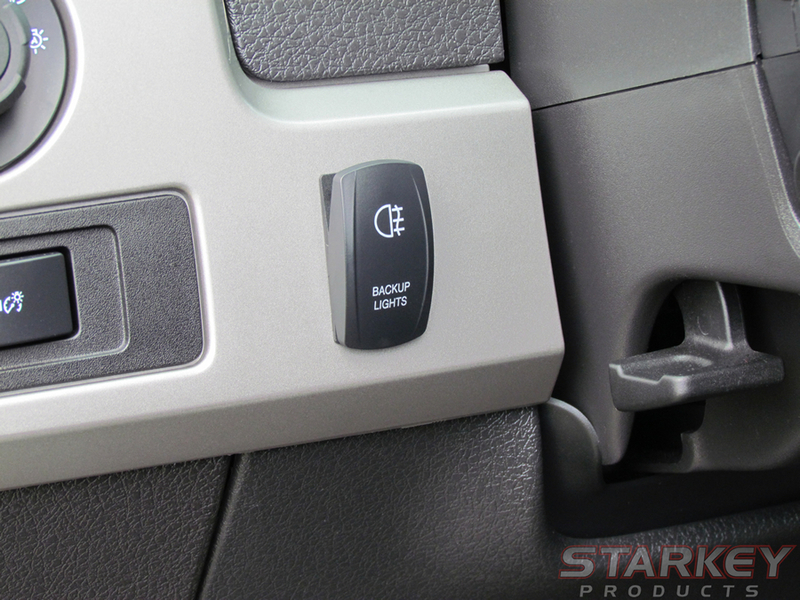 The Factory-Style switch insures you have full control over your auxiliary lighting system. The system can be activated with the switch anytime, even if the vehicle is off. Makes hitching up your trailer at night easy, and increases visibility for vehicles equipped with a backup camera. Assists the driver at night by illuminating the rear of the vehicle while in the reverse gear. Helps your vehicle get noticed when backing out of parking spaces, onto busy streets, and other high-traffic areas. The wiring harness will automatically trigger the auxiliary reverse lights when the system is activated with the included passenger compartment switch. Optionally, you can also easily configure the lights to turn on when the vehicle is placed in the reverse gear. Installation requires no cutting of factory wires! In addition, the harness draws power directly from the battery to insure that no strain is placed on the factory electrical system. This independent operation insures that the lights will function with the cabin switch even if the vehicle is off. You don't need to purchase anything else. 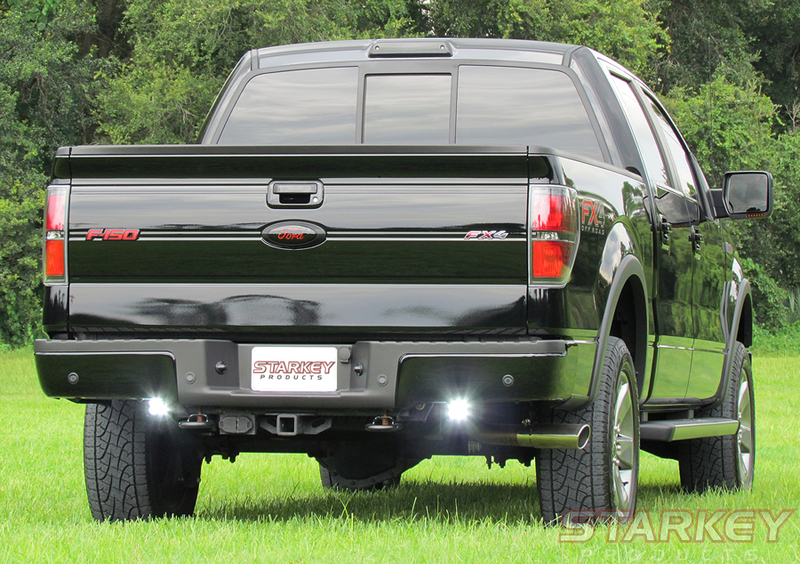 A factory-style switch, full wiring harness, and your choice of Rigid Industries lamps are all included. Universal - Fits all Trucks & SUV’s. Note: Harness may need to be extended for trucks over 23 feet in length bumper to bumper. If you are unsure of vehicle fitment, feel free to contact us. Mounting options for lamps vary by vehicle. Mounting hardware is included with all kits. Installation difficulty = Moderate – Requires use of rotary tool to cut out hole for switch. May also require drilling of 11/16” hole in firewall (varies by vehicle). Installation time = Typically 2-3 hours. Tools required = flat head screw driver, adjustable wrench (or socket set), pliers. Rotary tool (such as a Dremel®) to cut rectangular hole for switch mounting. May require drilling with 11/16” bit. 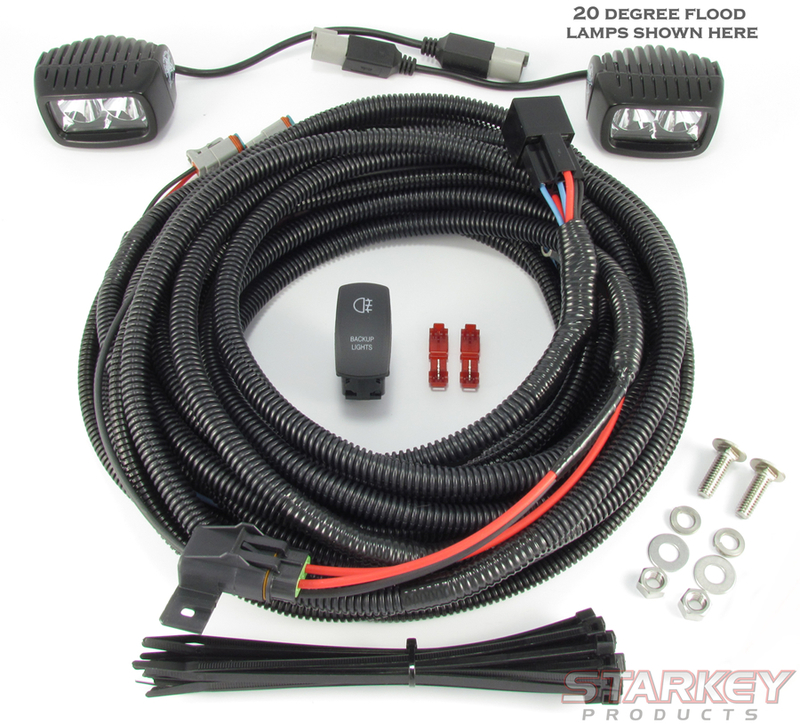 Rigid Dually Set – 20 Degree Flood Pattern: Recommended for those looking for a longer, narrower beam of light. Typically lights up the area directly behind the vehicle up to 50 feet back. Starkey part number 5200-DUA20. Click here for specification sheet. Rigid Dually Set – 60 Degree Diffusion Pattern: Recommended for those looking for a shorter, wider beam of light. Typically lights up twice the width of the vehicle up to 25 feet back. Great for general use. Starkey part number 5200-DUA60. Click here for specification sheet. Rigid SR-M Set – 20 Degree Flood Pattern: Recommended for those looking for a longer, narrower beam of light. SR-M lamps offer a more compact, low profile lamp for those less concerned about lumen output. Typically lights up the area directly behind the vehicle up to 40 feet back. Starkey part number 5200-SRM20. Click here for specification sheet. Rigid SR-M Set – 60 Degree Diffusion Pattern: Recommended for those looking for a shorter, wider beam of light. SR-M lamps offer a more compact, low profile lamp for those less concerned about lumen output. Typically lights up twice the width of the vehicle up to 25 feet back. Great for general use. Starkey part number 5200-SRM60. Click here for specification sheet. Browse 1 questions and 1 answers. Review your question to make any final changes. It may be sent to fellow customers so ask as if you were asking a friend. Your question has been submitted and it will be appear shortly after reviewing it. Just installed the fog light kit in my 2010 Mustang. What a fabulous product! Fit and finish are excellent; looks factory installed. The installation instructions were very thorough and accurate. I didn't have any questions or problems. Thanks, Starkey! Starkey Products, Inc. is an unauthorized independent alternative source aftermarket replacement/restoration crash parts manufacturer. The marks shown on the website are the property of their respective companies. Starkey Products disavows any affiliation, sponsorship, endorsement or approval by any company.